I am not sure that there is much to be learned scientifically from observing partial lunar eclipses but Anthony's composite demonstrates what we can only imagine while watching. 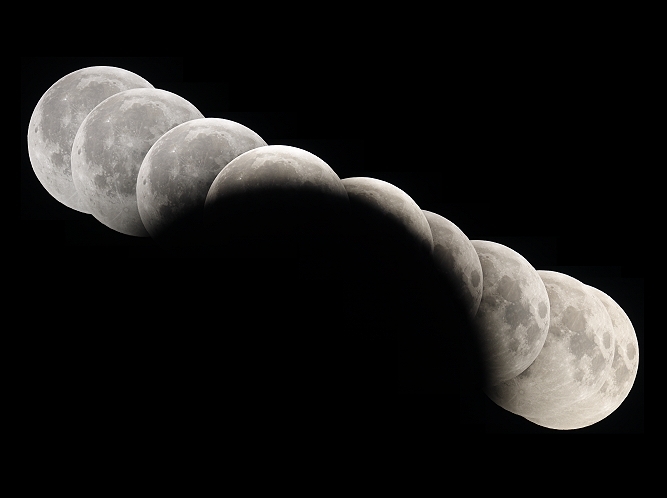 His series of nine images taken over three hours and 20 minutes shows the passage of the Moon through the Earth's shadow. The Earth's shadow - and thus the Earth - is considerably bigger than the Moon. We knew that, but the picture is more graphic than a statement of diameters: 12,742 vs. 3,476 km. According to these numbers the Moon's diameter is 27% of Earth's. I tried confirming that by measuring the diameter of the Moon on Anthony's mosaic. That is easy, but measuring the Earth shadow diameter requires guessing where the diameter is based of the exposed shadow. By my measurements the ratio is 35%. Is this a discovery? Is the Earth shrinking or the Moon growing? Anthony's webpage for this image gives the Moon's distance at the time of the eclipse - it was about 5,000 km more distant than average, so the ratio should actually be slightly smaller than 27%, not larger as I calculate. Hmm. Playing with enhancement tools in PhotoShop I see that the diameter of the Moon doesn't change, but depending on the contrast setting, the shadow does. Perhaps this is a better visual representation than a method to determine the size of the Earth. What do you think? Aug 16-17, 2008 , 22:30:00 - 01:50:00 UT+3. AP 160 f/7.5 StarFire EDF, AP 1200GTO GEM, Canon EOS 300D, 9 x (1/250 - 1/30 sec) ISO 200. More of Anthony's eclipse images.